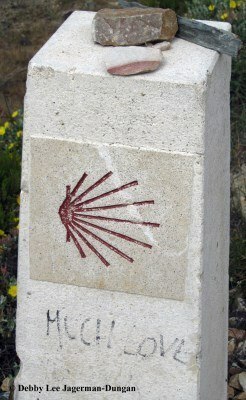 Three years ago I walked 150 miles of the 500-mile Camino de Santiago pilgrimage route, Camino Francés, across northern Spain. 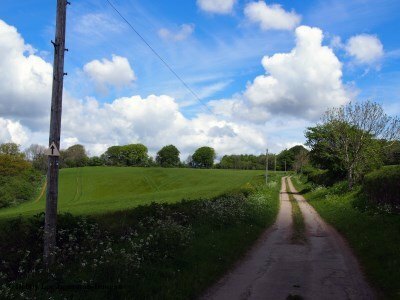 Last year my husband and I walked 100 miles of the 3,000 miles of public footpaths and roads throughout the Cotswolds area in England. 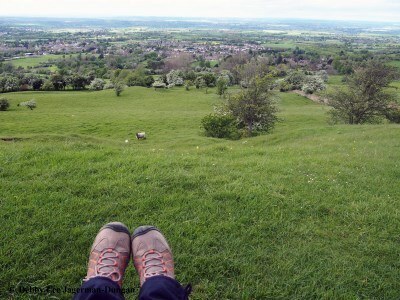 During our Cotswolds walks, I ended up discovering a few commonalities between the Cotswolds and the Camino de Santiago. 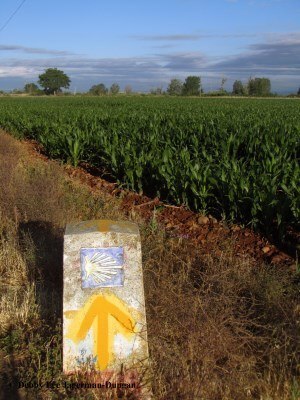 Yellow arrows are the way to navigate and find your way across the Camino Francés route as you cross Spain from the border with France to the cathedral in Santiago de Compostela. 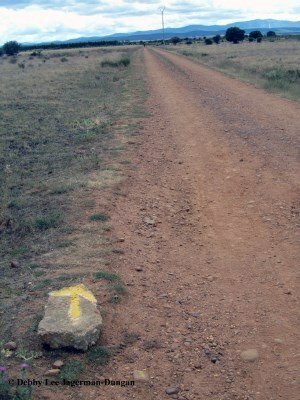 In fact, you most likely can find your way without the use of a guidebook or map just by following the yellow arrows. 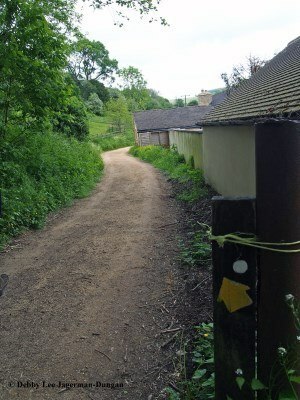 During our walks in the Cotswolds, I noticed a few yellow arrows as well. 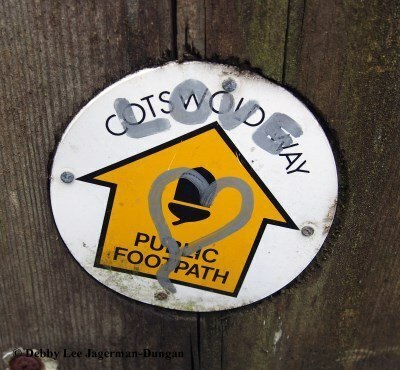 Since there are many types and colors of arrows directing you in the Cotswolds though, and because there are 3,000 miles total, guidebooks and maps would probably be very useful here. 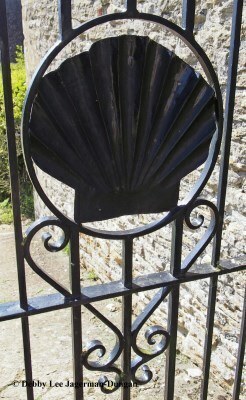 The symbol of the Camino de Santiago pilgrimage is the scallop shell. 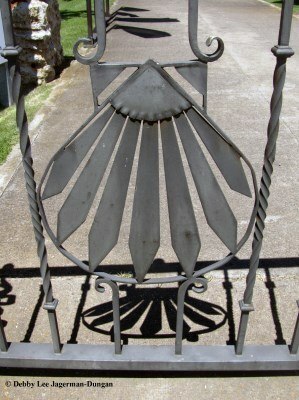 There are various reasons for this, including that the contours and features of the scallop shell represent the converging of people from all over the world, bound for a common destination, the cathedral in Santiago de Compostela. 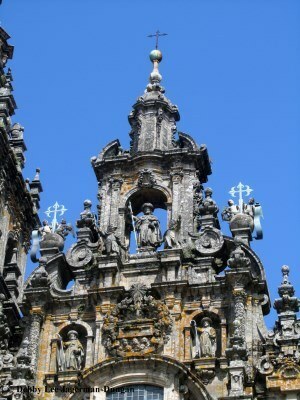 This cathedral contains the tomb of Saint James the Great, one of the Twelve Apostles of Jesus, and the patron saint of Spain. 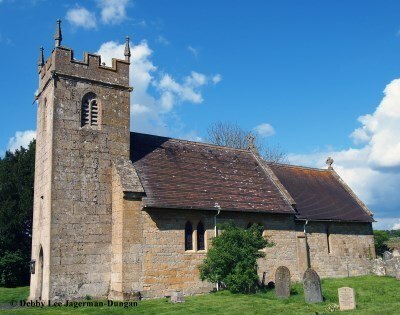 In the Cotswolds, I came across the scallop shell at a few churches, namely those churches dedicated to this same Apostle, Saint James the Great. As just mentioned, Saint James the Great is one of the Twelve Apostles of Jesus, and the patron saint of Spain, as well as of pilgrims, merchants, and pharmacists. 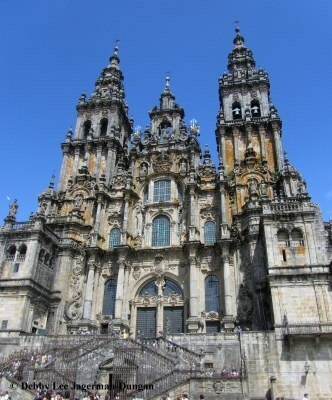 The destination of all Camino de Santiago pilgrimage routes is the cathedral in Santiago de Compostela because it contains the tomb of Saint James. 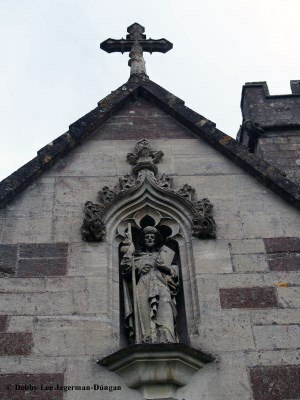 You see his image throughout the cathedral and along the pilgrimage routes. 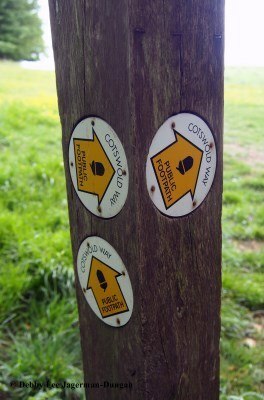 Another one of the commonalities between the Cotswolds and the Camino de Santiago is walking. 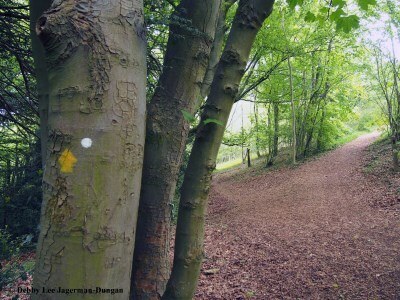 While one can bike around both these areas, walking is a more common mode of transportation. 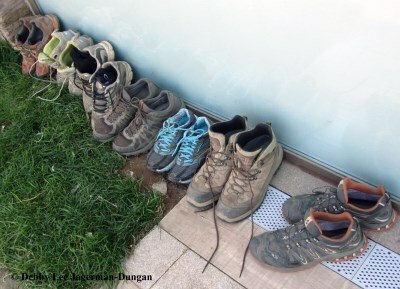 Thus the need for good walking shoes and boots. 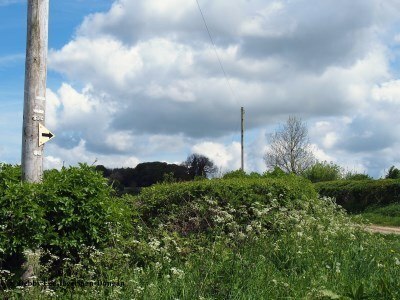 While I would love to go back to the Cotswolds someday and explore the other 2,900 miles, for now I am definitely returning to Spain very soon to walk the entire 500 miles of the Camino de Santiago route of Camino Francés across northern Spain! 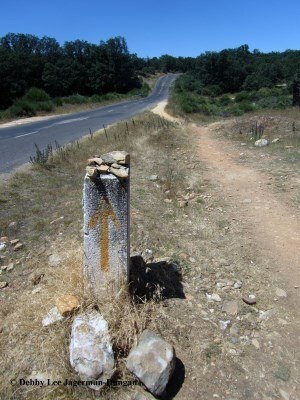 This will include the 150 miles that I have already done, plus I would like to walk an additional 55 miles to Finisterre on the Atlantic Ocean, and 20 miles up the coast to Muxía! I have my plane and train tickets! And I have a good pair of boots! 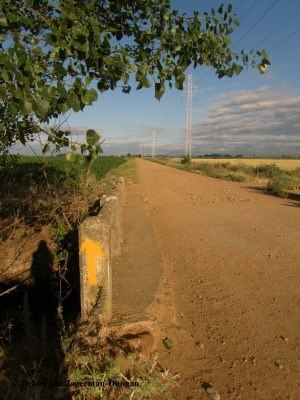 For other blogs from my Camino de Santiago travels, please visit my Camino de Santiago category. 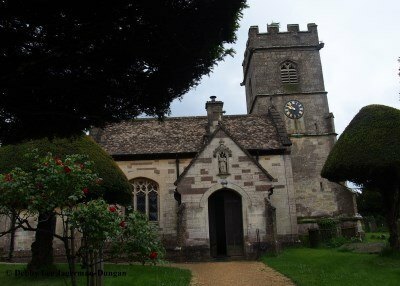 This entry was posted in Camino de Santiago, Cotswolds England and tagged Camino de Santiago, Cotswolds England by debbysdepartures. Bookmark the permalink. Beautiful! Do u think u r the first to notice the commonalities? I do! Thank you! Yes, perhaps I am the first! ?